We stayed in this beautiful, big cottage where we actually only slept. We didn’t use the kitchen, which was more than fully equipped but we always went to the big house for breakfast, lunch and dinner. The bedrooms and living room were nicely decorated and spacious. We loved the cottage. The only thing which I would have improved are the mattresses in the parents bedroom, they were quit hard. Thank you so much for everything you did, Marina! We had a fantastic week. Big hug from us to you and your family ! Me and my friends spent a week in this wonderful villa. The rooms were beautiful and comfortable, and the gardens were amazing! Great place, great location, and Marina was wonderful!!! Ci siamo trovati benissimo. Casa centralissima, di fronte al Teatro storico della città e a due passi dal centro storico. Stupendi gli interni con soffitti originali affrescati e camere comode. La nostra host fantastica, molto gentile e super disponibile. Da tornarci subito. Anche domani! Accueil formidable par Marina en voiture dès la gare de Spoleto et malgré des changements de moyen de transport… Emplacement unique en plein centre ville dans une maison ancienne fraiche et modernisée dans son style original. Accès facile et pratique à l’appartement, équipement impeccable avec lit neuf, salle d’eau agréable,coin cuisine bien pensé, ameublement sympathique. We had a lovely time at the apartment in Spoleto. Location is perfect, in the old town, nearby everything in the city. The apartment is fresh and cosy. Marina was very kind and friendly, I would definitely recommend this place. The host did an excellent job making us feel welcome. While we ended up needing to stay elsewhere for an issue outside of Marina’s control, she found us an excellent alternative. She even helped arrange a private cooking class for my wife and me. She’s a superb host. This was our first experience with Airbnb and we were more than delighted. 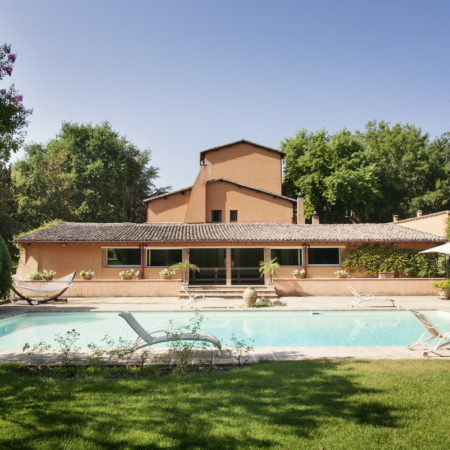 The warm and yet efficient organization by Marina, the heartfelt welcome by Luigi and his wife and mother and the whole experience of being included in the family and yet left in peace to enjoy the beautiful house, garden, pool and tennis court was amazing. 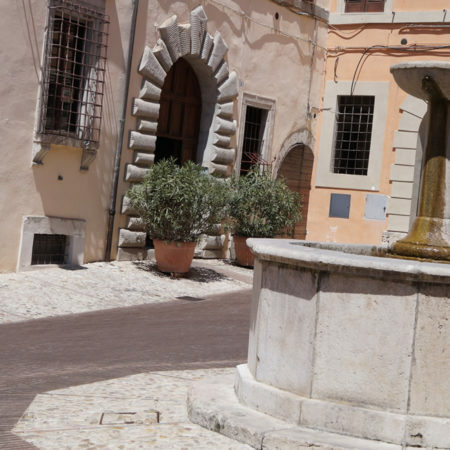 In addition the town of Spoleto, 5 mins away, is fascinating and we had the feeling at the end of our week that there was much more to see and explore and we should have booked for (much) longer. In short, lovely people, wonderful property and an unforgettable holiday!!! Our stay was great. The setting, the pool, the location…we’re really thankful things didn’t work out with the original rental because this one was excellent! The internet was unreliable, but other than that we were really pleased! Our experience was fabulous. Marina greeted us with huge friendly smiles, super helpful with supportive child experiences, and we felt like we were at a superb home away from home. 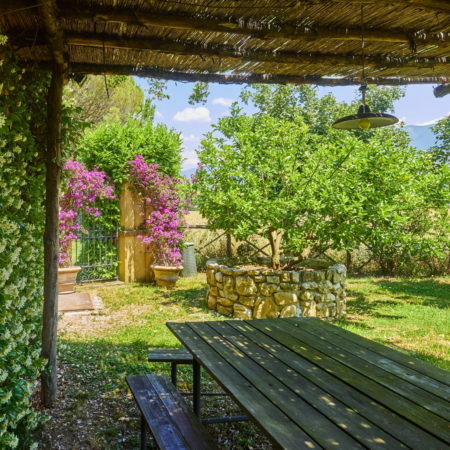 Perfect for children..soccer field, swimming pool, other children to play with, a beautiful organic garden, very beautiful. Would recommend highly. 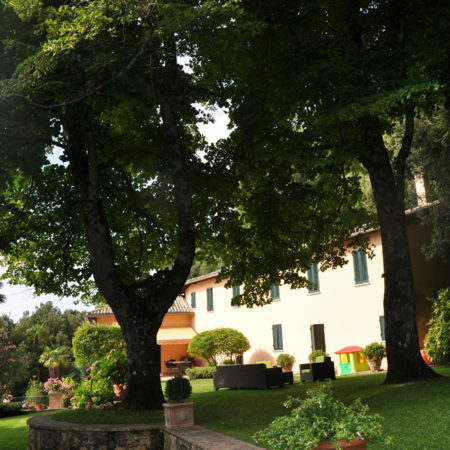 The villa was fantastic, a marvelous old farm house renovated by architects, classy and authentic. Very well equipped, all you need in a kitchen, and a baby foot game ! 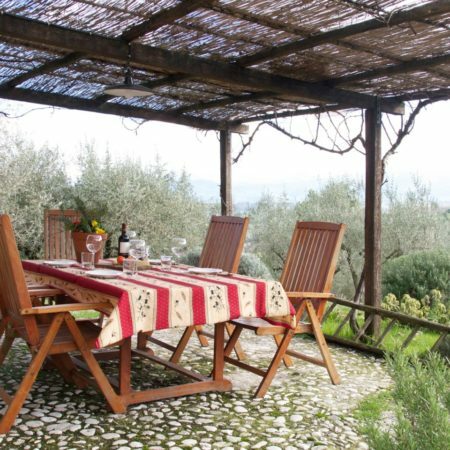 The landscape surroundings equally great, a lovely terrace under a vineyard pergola looking over the valley and olive trees. Our worry during our stay, during an exceptionally hot week (over 35°), was some unpleasant smells coming a nearby pig breeding factory, especially in the evenings and nights. Marina, a fantastic host, was totally sorry about this situation, and made everything she could to solve the problem. It was not perfectly clean. I had to clean myself the barbecue, which was very dirty, and fridge or oven were not quite OK.
Parfait !!! En face du théâtre, très grand, très propre et près de tout. J’ai oublier les clés dans l’appartement et Marina sans problème et revenues m’ouvrir la porte avec son grand sourire, sans souci…. We had a most wonderful stay in Spoleto. The apartment was beautiful, clean and full of character. It’s location was perfect, right in the middle of the old town making it an ideal base for exploring the whole area. Marina was a fantastic and friendly host, who gave us lots of great local information and made us feel very welcome. I would not hesitate to re commend this apartment and hope to make it back one day ourselves!! Picturesque setting, rustic but up to date accommodation. Marina was very helpful and accommodating. 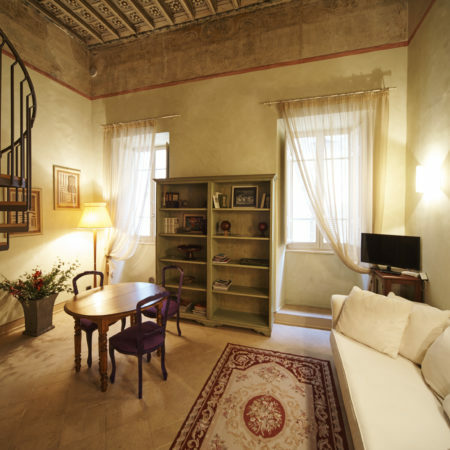 The apartment is very well located in Spoleto. It’s spacious, clean, well equipped with all you need for your stay. The beds are very comfortable, everything worked just great! Marina is a very helpful host, she helped us with finding the parking lot close by, gave us hints about the city, restaurants, attractions in Spoleto, Spello and Assisi. Thanks a lot, Marina. We definitely recommend staying at Marina’s apartment. Thank you for having us, we had a lovely time. The house was perfect for us all and great that the kids had space to run around. Only downside was the sound and smell of squealing pigs, but you great pretty used to that quite quickly. We would love to come back when with more time! Thanks again. Dear Marina & Chiara, We have arrived back in the states. We had a wonderful time in Umbria, especially in Spoleto. These places are really magic!! We were all very happy, and the apartment and the location worked out marvelously. Ho avuto il piacere di fruire dei servizi offerti da magic-umbria.com Segnalo a tutti i potenziali utenti la grande cortesia, la disponibilità e l’accuratezza nei servizi resi e nelle informazioni fornite. Esperienza estremamente positiva. Raccomandato a tutti. We have thoroughly enjoyed our stay in these lovely apartments. They are clean and well appointed and very central to shops and restaurants. Perfect for all our requirements, Marina was very friendly and helpful showing us where everything was and any queries we had. She was more than happy to help us with at any time. Wonderful apartment. Very clean and spacious. Great location too! Nearby shops, cafes and restaurants. Marina is a gracious host. Our arrival time changed over the course of the day and she was able to accommodate us. She even drove us to the nearby parking garage so we didn’t get lost. She has 2 other apartments in the same building for larger groups or families traveling together. We would stay here again, without question! 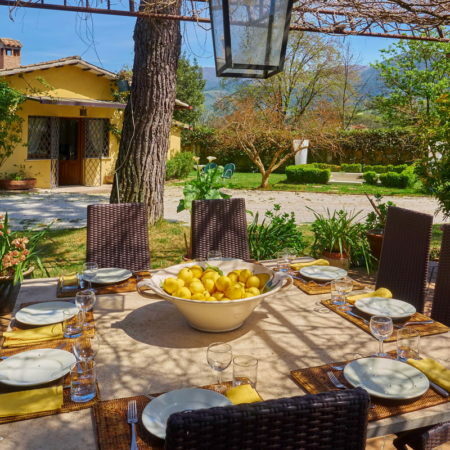 We have had a wonderful time staying here in Spoleto on our honeymoon, particularly having such a lovely place to stay. The apartment was clean, spacious, quiet and beautifully furnished. We loved the terrace and spent many our evenings out there drinking good local wine! 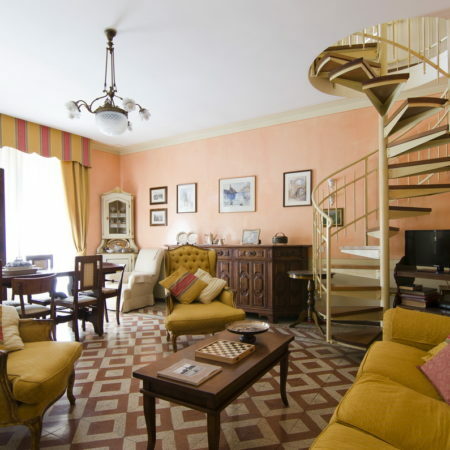 The apartment is also ideally located close to shops, restaurants & historic monuments. Marina was always so friendly and always happy to help us with any question, for example she arranged some cooking lessons & Italian lessons for us which we very much enjoyed. We would highly recommend both, the apartment and Marina’s services to anyone looking for a lovely holiday stay. Marina was incredibly welcoming and helped us find good local restaurants and navigate the touring options. The apartment was fantastic. It is very stylishly decorated and comfortable. The bed is very roomy and comfortable ensuring a good nights sleep. We loved the location and we felt so lucky to have found such a stunning apartment. We stayed in Apartment 1 for a week and loved it. It is incredibly spacious and full of light. 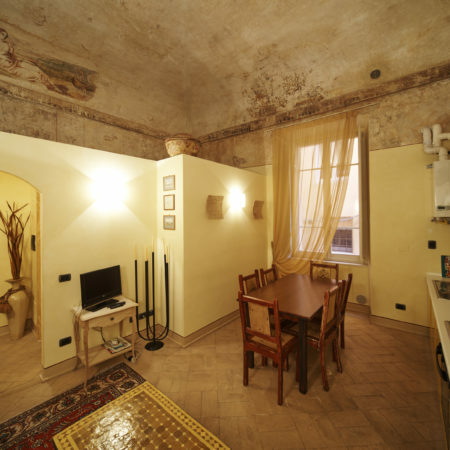 It is a beautiful, clean apartment right in the center of Spoleto. I have been to Spoleto many times and I couldn’t ask for a better location. 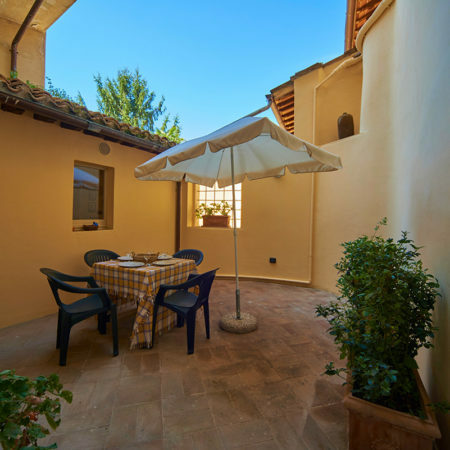 The apartment is modern with everything you need and has a gorgeous little terrazza. It is located perfectly so that you can access all the shopping areas – Piazza del Mercato, Piazza Garibaldi and Corso Mazzini yet despite being so central it is very quiet at night. The lounge and main bedrooms are very large and my children loved the upstairs loft. I can’t speak highly enough of the manager Marina who was extremely helpful. She is fantastic. The photos don’t do this apartment justice. I am so glad I found it and would not hesitate to recommend it. I will definitely be returning in the future. Thank you so much for such a memorable first stay in Spoleto. The apartment was perfect and exactly what I need for a successful trip. It was quiet, comfortable and perfectly located in the center. Also, steps from the theater! Thank you to Marina for providing a TV and making sure it was in working order for those few moments I was not rehearsing. I hope to be back very soon!! This apartment was PERFECT! It is so well situated if you want to be in Spoleto, especially if you like theater, as it is directly across the road from one of the main theaters in Spoleto. We were there for the festival and so could not have done better in where we stayed. The apartment is clean and beautiful, comfortable and nicely done out. Marina was relaxed, friendly, and helpful. I just wish we had had more time to get to know her. I really recommend this apartment. Be aware however that the 2 bedrooms are split level, so no door between the 2 single beds upstairs and the double room downstairs. Plus you share the bathroom. For us it was not an issue as we were family. But 2 separate couples may not wish to hear each other snore!! Thanks Marina. I am very glad we stayed in your apartment and if I or any friends are in Spoleto, for sure we will stay again. This apartment is wonderful. Perfectly located and quiet. The space feels so comfortable, and it is very nice size. The inner terrace is especially beautiful and relaxing. Everything I needed, I had. I couldn’t hope for more. Marina is great about immediately responding to you for any concerns. 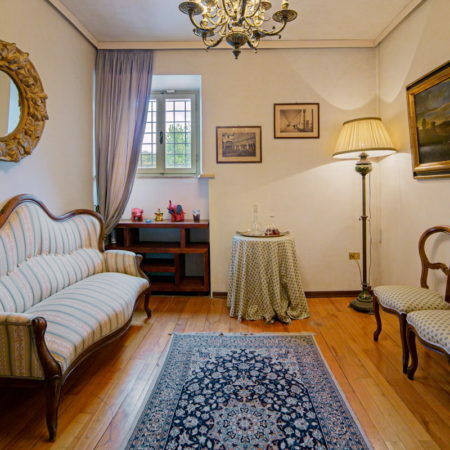 Franc d’Ambrosio and I are deeply grateful to you for providing us with an absolute lovely apartment, so perfectly located in Spoleto, during our time with the CCM Spoleto Music Festival. Your service was impeccable. Thank you for a wonderful stay in your beautiful apartment. I enjoyed spending the summer in your generous hospitality. The Via Posterna apartment worked out very well for us this year. Thank you for finding and securing it. Hope to see you and our many friends in Spoleto next summer!! many thanks for your efforts this summer towards my comfort. I hope to return to Spoleto and I look forward to seeing you again! 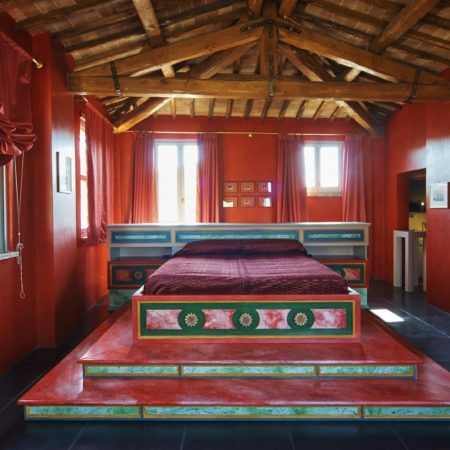 Casa bellissima in posizione strategica. Marina si è dimostrata molto disponibile. Consigliatissima. Thank you to help us to discover Umbria!! These places are really magical ! Spoleto, Spello, Assisi, Todi…We will miss them!! The apartment was perfect: elegant, well situated in front of the Teatro Nuovo where We saw the magnificent opera “Cenerentola” !!! Marina apartment was beautiful, clean and comfortable. Marina was nice and helpful and we found Spoleto as a convenient location for journeys in Umbria and Tuscany. Highly recommended! We were traveling in Italy when we decided we wanted to spend the last 4 days in Spoleto. We connected with Marina who responded immediately to our short notice request. We had some special needs that went above and beyond and she worked out a great solution for us. The location just blocks from the pedestrian street with shops and restaurants and the opera across the street was ideal. The decor and amenities were perfect!